Recently, I sat down with an Intrepid Reporter who wanted to talk about my serial killer book, EYES WITHOUT A FACE. 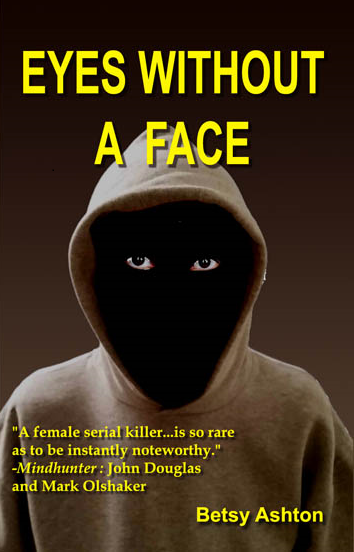 Intrepid Reporter: I understand you recently wrote a book about a female serial killer. Do I have that right? Me: Well, since you are reading from the press release, yes, you have that right. IR: What ever possessed you to write about such a dark subject? Me: Nothing possessed me, if you mean, was I taken over by a spirit or something like that? Me. It was the result of a double-dog dare. You can never turn down a double-dog dare. IR: Really? Who dared you? Me: That’s what the teacher said. She went on to double-dog dare me to turn the opening into a novel. I did. IR: May I assume you are not a serial killer? IR: How were you able to get inside the head of such a, um, well different character? Me (signing): It’s called using the creative gene. I imagined what it would be like to be a killer and wrote about it. Simple as that. IR: I think it would be very hard to write this book in first person. Me: No harder than in third person or from the point of view of a dog. Me: Never mind. It was a challenge, but one I was ready to take on. I’d never written anything with such an unlikable character. Strike that. Some people think she’s likable. IR (shaking her head): I couldn’t, but then again I’m not you. Me: And you should be glad you aren’t. Imagine what my husband had to live with for the three years it took to shape and polish the book. IR: I’d rather not. Let’s move on. The cover is very chilling. Me: It’s supposed to be. I asked my son to put on a hoodie and ski mask that covered his lower face. I gave that picture to a cover designer who took out the rest of his skin, overlaid the eyes, and created a character without a face but with eyes that follow you. IR: I can’t imagine what your dinner table conversation is like. Me: Pretty normal, actually, except talking about using KA-Bars or switchblades for killing. IR: But you don’t have a KA-Bar in the novel. IR: I think it’s time to take a little break. The second part of this interview appears on this blog on February 12. Stay tuned.